Blue Horizon: The Captain’s Journal, Book 2, by Ted R. Blasingame – book review by Fred Patten. Blue Horizon: The Captain’s Journal, Book 2, by Ted R. Blasingame (with Eileen Blasingame and Steve Carter). Revised edition. Raleigh, NC, Lulu.com, March 2015, trade paperback $16.99 (346 pages). 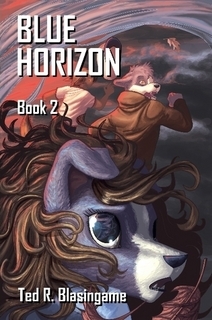 Blue Horizon, Book 2 follows smoothly after Book 1, reviewed here in March. If you liked Book 1, what are you waiting for to get Book 2? If you haven’t read Book 1 yet, you should start there to introduce yourself to Captain Merlin Sinclair (wolf) and the anthro crew of the interstellar freighter SS Blue Horizon, and the human and Furred worlds of the galactic Planetary Alignment. Ted Blasingame, his wife Eileen, and Steve Carter originally wrote 31 adventures of the Blue Horizon on their early website during 1996 to 2003. They were published in separate Books, then combined in one Lulu.com volume in December 2003 that was HUGE – I literally could barely lift it. Blasingame and the others continued to write new online adventures until 2009, when they closed their website and went on to new projects. Now Blasingame is revising and polishing the out-of-print stories, adding the newer ones to them for a total of 45, and dividing them into four more easily-held Books with new covers by Elizabeth Jackson. Books 1 and now 2 have been published so far. Book 2 contains Episodes 12 through 22. Although they are presented as separate stories, they flow smoothly into one another like the chapters of a novel. It is assumed that the reader is familiar with the characters and events covered in the first eleven episodes. These second eleven episodes are no longer all presented in the format of an opening excerpt from Captain Sinclair’s journal, with a flashback to the full adventure. Catalyst and Catacombs – book review by Fred Patten. NYC, Ballantine Books, January 2010, hardcover $26.00 (256 [+ 5] pages), Kindle $7.99. NYC, Ballantine Books, December 2010, hardcover $26.00 (236 [+ 3] pages), Kindle $9.99. McCaffrey and Scarborough, two well-known cat-lovers, focus upon cats of the interstellar future in this two-volume series. “Hood Station, where they had just docked, was a backwater facility providing the interface between the agro-based planet Sherwood and the rest of the universe.” (Catalyst, p. 3) The opening lead characters are Janina Mauer, a human Cat Person, and her charge, Chessie, the Barque Cat of the interstellar freighter Molly Daise. They have just arrived at Hood Station. Janina’s exact age is not given, but clues make her a rather naïve young woman. 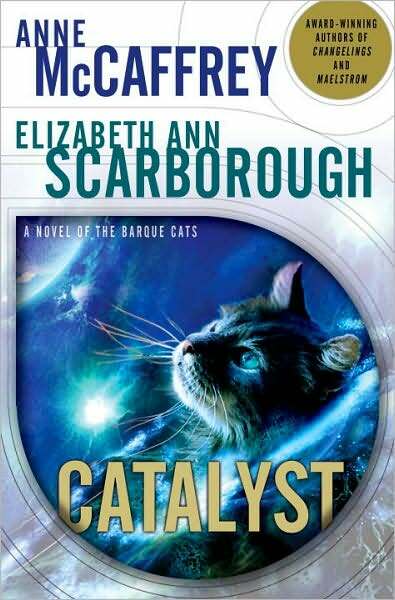 Barque Cats “are highly prized, as [they] are not only superbly bred but have all grown into the best ships’ cats in the universe.” They “save lives […] patrol the tight areas of our spaceships, keeping rodents from eating the coating on cables, smelling hazardous gases and even escaping oxygen”. (p. 4) They are extremely valuable, leading to Chessie being bred as often as is safe. And although Barque Cats are already highly intelligent cats, clues tell the reader that something in their diet on the frontier planet Sherwood is making both them and other Earth animals mutate or evolve into real sentience. “As Jared then moved on to a quick, competent feel of her [Chessie’s] fecund belly, he asked Jenina what was concerning her.